Last night, few of us slept. The winds were crazy, everything kept falling off shelves. At one point, my phone fell off the hook and I could hear the receptionist saying, "Hello? Receptionist. Hello?" I had to pick up the phone to tell her it was an accident. At meals, the guests sitting on the hardwood floor at the center of the dining room slid across the dining room, spilling food and drinks and in some cases, landing on someone's lap. I was laughing, but some people were seriously alarmed. That's one thing I wish someone had documented in pictures but who knew that would happen? It is hard to really capture in pictures how high the surf is. 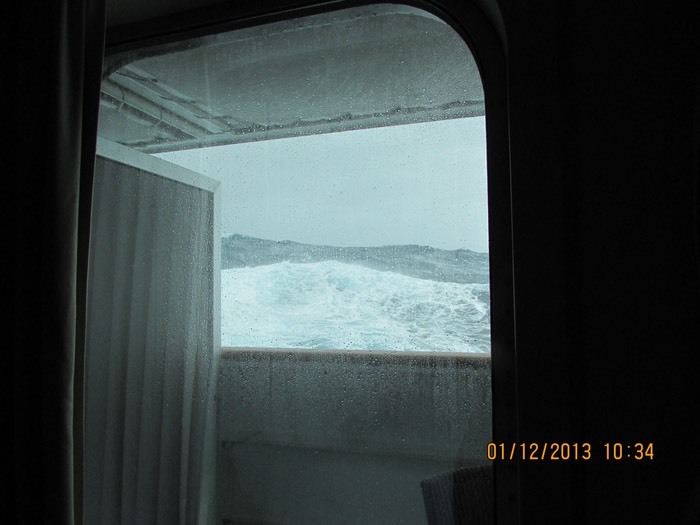 This is taken from inside my cabin. That's not horizon - that's a swell. Formidable! Some passengers are terrified and crying. They get valium from the doctor. Some guests' deck furniture flew overboard so staff went room to room to bring the deck furniture inside. It's weird because the sky is quite light, but the winds are wicked! Apparently they are 55mph+ - 10 on the Beauford Scale of 1-12. The waves are 50 feet high. The captain says that we have to slow way down and take a detour to deal with the storm and so we will be landing on Antarctica late - how late cannot yet be determined. I just find it hard to sleep because after the boat shifts in response to the swells, it makes a major clunk and it's very noisy. So I am spending most of my time reading a Jo Nesbo book on my kindle. Not much else going on. They expect this weather for the rest of the day. Hope we can land tomorrow on Antarctica. I was about to step into the elevator, thinking, "Isn't it amazing that elevators can function despite the weather?" Oops, I was yanked out of the elevator and told it was not safe until the seas had calmed. That makes more sense. I miss my tea. They can't put out the hot water and tea because it's impossible to carry without spilling. I still have my cold but it's getting better slowly. Courvoisier works well to coat the throat. Note: we have found out that 3 ships did not make it through the storm and one of those ships, with many teen agers on board, was damaged by the storm. The passengers were apparently not harmed but the captain has a dislocated shoulder, a crew member has a broken nose, and they are on their way back to Ushuaia. We heard they were travelling at too high a speed and did not alter their course. Don't know if that is true. Don't know if they could have avoided this accident. We were very lucky that our captain planned for this and made adjustments accordingly. The other two ships are back on course but way behind us.